Many of our customers use labels to further categorize their team emails. As labels are not bound to a user, but to the whole shared inbox, all team members will work with the same labels. No wonder, labels is one of the most used feature in Helpmonks. 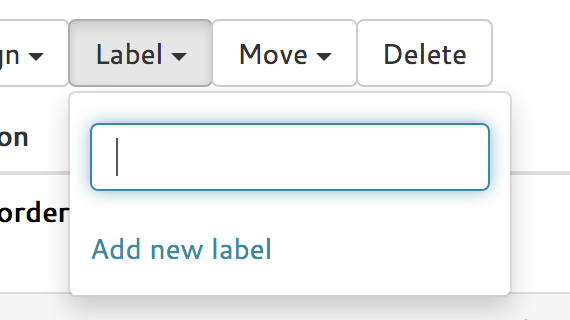 As labels are frequently used, I’m happy to announce that adding a new label just got easier. As of immediately, you can add a label from within the message list and/or within the message detail page. From the label drop down menu you have the option to add a new label easily. ####Wondering why all the successful startups use Helpmonks? Helpmonks is the ridiculous easy way to share an inbox with your team. Join today for a free trial. A [Helpmonks shared inbox](http://helpmonks.com] is only $9/month. When creating a new label from within the email it should also add the label to the email at the same time. Current process requires double handling: Create the label which exits the create label dialog, then you have to access the add label again to add it to the email. Thanks for the feedback. It’s now always so that customers want to add it at the same time. But let us see what we can do for it in the future.